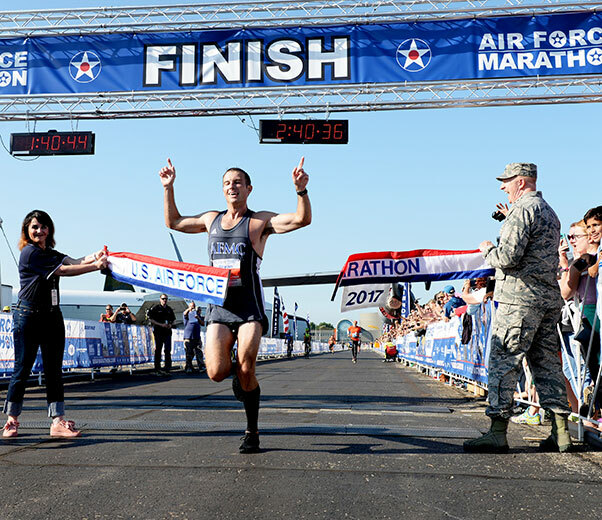 Bryan Kelly crosses the finish line as the overall winner of the full marathon at the 21st running of the 2017 U.S. Air Force Marathon at Wright-Patterson Air Force Base on Sept. 16. Kelly, from Edwards, California, finished with a time of 2:40:34. These were the words of the winner of the Air Force Marathon held at Wright-Patterson Air Force Base, Ohio, Sept. 16, 2017. 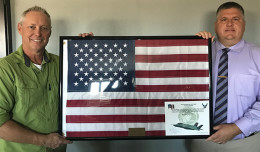 Maj. Bryan Kelly, a test pilot with the 419th Flight Test Squadron at Edwards Air Force Base, Calif., took first place overall with a finishing time of 2:40:34. His average pace throughout the course was 6:08, just over six minutes a mile, or just under 10mph. 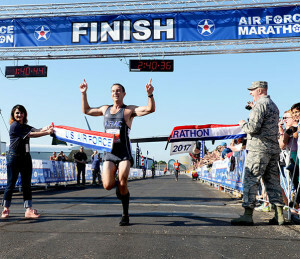 Kelly has run other marathons, including the Air Force Marathon twice before, but this was his first win. “This was my first time winning a marathon, and the fact that it’s the Air Force Marathon meant a lot to me personally,” Kelly said. Then he caught up to the number two runner, passed him, and soon caught sight of the car that was leading the race. 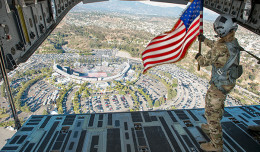 More than 15,000 runners took part in the Air Force Marathon’s four events – the full 26.2-mile marathon, a half-marathon, and a 10k and 5K race. Kelly runs marathons simply because he enjoys it. “I love the challenge of trying to improve myself,” he said. Kelly said he will continue to train, and is looking at a couple of race options later this year, including an Ironman triathlon in November.